On graham crackers and biscuits. Few Americans who have not lived outside America realize how American graham crackers are. They are one of a number of American things that non-Americans either instantly recognize as being quintessentially American, or else have never heard of. Things like red solo cups, peanut butter, and brownies. I myself didn’t realize this until, sometime during my first year at Edinburgh, I needed to use graham crackers in a pie crust, and couldn’t find them in the store. I had to use digestives instead, and it just wasn’t the same. But what really struck me about the experience was how later, when talking this over with a friend, I learned that he had no idea what graham crackers were. He’d never heard of them. And the more I tried to explain them, the less it made sense. See, to a British person, the closest thing to a graham cracker is a digestive. So describing them in terms the British person can understand is like saying they’re almost digestives, except drier, thinner, and not as sweet. None of which sounds very appealing. But Americans are raised on graham crackers, just as surely as mac and cheese or peanut butter and apples. They’re one of the iconic tastes of childhood. Learning exactly how long one can dip a graham cracker in milk before it breaks off and sinks to a soggy mass at the bottom of a cup is one of the skills American children must master before they transition to middle school. It’s how you know your hand-eye coordination skills have become fully-formed. Which brings me to another difference between Americans and the British: Americans drink milk. Lots of it. And it is our preferred dipping medium. We do not dip things in our tea. Rarely do we dip things in our coffee. In fact, the only exception that springs to mind is biscotti, and those are relatively new and European. Oh god, the bourbon cremes. I miss them so much. in tea. Some of them are analogous to various cookies you might find in the store over here, but they’re not graham crackers. I know, because today I performed the ultimate experiment: I tried dipping graham crackers into my tea. It was a decidedly unsatisfactory experience. 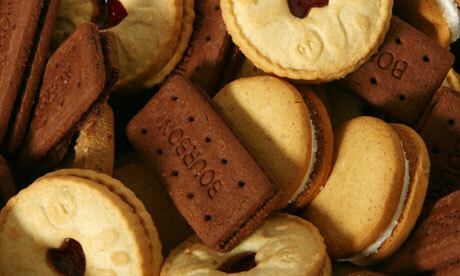 I love British biscuits. I weep for them, some days. But I feel sorry for any British person whose encounter with graham crackers left them feeling as though they were somehow shallow imitations of a digestive. They’re their own thing, you guys. You dip them in milk, sandwich marshmallows and chocolate between them for s’mores, and crush them to pieces for pie crusts. Their dryness isn’t a bug; it’s a feature. It allows them to soak in liquid faster, and keeps crusts from becoming overly oily. They’re not a harmless snack, but it’s easier to convince yourself they’re somehow healthy in a way biscuits won’t ever be. And although I’ll probably never mourn their absence the way I do bourbon cremes, they deserve credit for their stalwart service on behalf of cheesecakes everywhere. They are not interchangeable with biscuits.